Welcome to StuckatTheAirport.com. Here are some travel tidbits for you. Paying close attention to legislation that requires large and medium airports to provide lactation areas in every terminal by October 2020, the Port Authority of NY/NJ has upgraded the Mamava lacation pods in its four commercial airports. The new, post-security nursing facilities are larger versions of the previous pods and include 12 at JFK, nine at Newark Liberty International Airport, six at LaGuardia Airport, and one at New York Stewart International Airport. ROAM Fitness, which has an in-airport gym at Baltimore/Washington International Airport, has a contract to open a second location this summer at San Francisco International Airport Terminal 2 in collaboration with XpresSpa. At Your Gate, which currently provides app-powered gate delivered meals at five airports – San Diego International Airport, Newark International Airport, LaGuardia Airport, JFK T2 and Minneapolis Int’l Airport – will soon add Portland International Airport as its sixth location. And Airport Sherpa, which currently offers a similar app-powered gate delivery service for meals at Baltimore/Washington International Airport, has inked a deal with airport restaurateur HMSHost to offer on-demand mobile ordering and food delivery at all the North American airports where HMSHost operates. No word yet on the timetable for the roll-out beyond BWI, only that the plan is to “quickly introduce the technology with strategic airport partners throughout the United States,” says HMSHost. For National Walking Day (April 4), airports around the country were on Twitter and Facebook reminding passengers about the marked walking paths in the terminals. As someone who arrives at airports hours early for a flight in part to make sure I get my daily steps in, I’m a big fan of this airport amenity. Let me know if you see more #NationalWalkingDay tweets from airports so I can add them to the list. Ever slow down to take in the art in National Hall? Since it's #NationalWalkingDay, take a self guided tour and share your favorites with us. Airport yoga rooms are great amenities, but Cathay Pacific suggests you try doing yoga on the plane. The airline has partnered with Pure Yoga to offer an inflight “Travel Well with Yoga” program that offers a series of six yoga videos with meditation exercises and tips. The videos are in English, Cantonese, Mandarin and Japanese and are running on Cathay Pacific and Cathay Dragon routes in the Lifestyle section of the inflight entertainment program. Instructors offer yoga and meditation routines that can be done before, during or after a flight (if you’re not to self-conscious to try it) and are designed to improve circulation, enhance joint mobility – and relax the mind. Some moves work on the plane – even in economy, says the airline – others you can do when you unfold from your seat and get to your hotel. Although bars and restaurants will beckon, travelers at an increasing number of airports have plenty of places to stretch and work out. 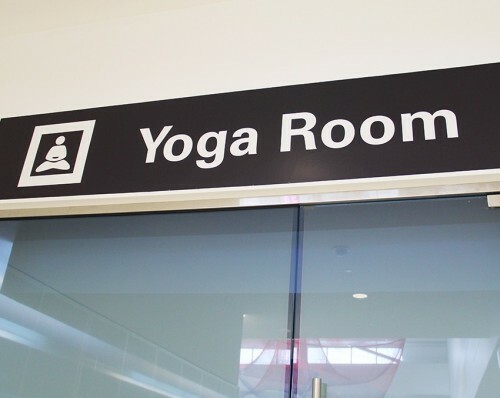 Baltimore-Washington International Airport has an airport gym, Phoenix Sky Harbor International and many other airports offer marked walking paths, and San Francisco International Airport, Dallas/Fort Worth International Airport, Chicago’s O’Hare and Midway Airports and others have free-to-use spaces set aside, with loaner mats, for yoga. Now Denver International Airport gets its chance. For 90-days, starting November 6, Denver International Airport will have a pop-up guided yoga studio on Concourse A where travelers can pay to use private mini-studios for yoga sessions lasting from 15 to 60 minutes. With each rental, Yoga on the Fly will provide instructional videos, yoga mats and wireless headsets. Sessions will costs $15 for 15 minutes, $20 for 20 minutes, $30 for 30 minutes, $45 for 45 minutes and $60 for 60 minutes. Each studio with have a ‘beauty bar’ with cleansing towels, face mist, hand sanitizer and lotion where customers can freshen up after their session and there will be a retail section at reception offering travel accessories. If this first Yoga on the Fly pop-up is successful over this holiday season, company founders hope to make it a permanent amenity at Denver International Airport and other airports.